Colton Davie is the type of person I always figured I’d be. In seventh grade, I was sent to the vice principal’s office because of a fight. Or, skirmish? Skirmish might be the better word here. I just punched a kid because he was being annoying. I was sent home crying and visited the office the next day. (I couldn’t in good conscious pretend I was some badass kid who beat up people on the regular, I definitely cried pretty good being sent home that day. I really thought I was in trouble.) In the office that day, Mr. Kapishka’s brow furrowed. In the midst his disciplinary efforts, he asked, “What do you want to be when you grow up?” I told him I wanted to be a cinematographer. I probably couldn’t even spell cinematographer at that point. But Colton, he walks the walk. He really is a cinematographer. A camera toting, knows how to use a light meter, Arri Alexa operating, true-blue cinematographer… something I always thought I’d be. So, I was very excited to talk with Colton and hear his insights on filmmaking from a traditional perspective. I’ve spoken with a number of talented filmmakers on this site, but I don’t believe any have the operation history that Colton possesses through his narrative work in LA and beyond. World of Echo: What’s up, Colton? Oh! Hey! Hey, how’s it going? Going good. How are you doing? Awesome. You got time to bang this out? Sweet. What are you working on right now? Umm… I just got off of a shoot. I moved up to Portland from LA a few months ago, but I was just back in LA for a shoot, and now I’m getting ready for another one there. I’m still keeping tied down over there. What prompted the move out of LA? Was it too dirty for you? The Pacific Northwest looks amazing. My sister studied in Oregon and Washington her senior year of college. Breathtaking stuff out there. It’s really beautiful. It’s always this rich, deep green. Near Portland you have the river and Mt. Hood too, which is great. I’ve only been to LA once and don’t get me wrong, LA was really cool, but it was eye-opening how dingy it was. Yeah, you go down the Walk of Fame in Hollywood and you’re like, “Oh, this is pretty grimey!” It’s not really the glitz that you’d expect. It just smells like pee. [laughs] So you grew up in Alabama, but you were born in… damn, I just had your bio up. Where were you born again? That’s what it was, ok. So you grew up in the south, though. What was that like? My parents are both from Alabama, but they went to law school in Texas. I lived there for the first ten years of my life, but during that time they had always talked about moving back towards Alabama. But I loved Dallas as a kid. We lived in a suburb called Coppell and we would just ride our bikes everywhere, all of us kids in the neighborhood. Basically if we weren’t in school, we were on our bikes somewhere. Then we moved to Florida for a little bit, near Destin and Panama City. We were there for several years before eventually moving up to Montgomery, Alabama. How close is that to say, Pell City? Or Birmingham? It’s pretty close, about two hours away. Monster Mountain is right there. Yeah, that’s what I was getting at. [laughs] That’s my only geographical reference point to the south, Monster Mountain. Monster’s great. I probably haven’t been there in over ten years now. I raced up until I was eighteen, so we we grew up racing at Monster Mountain. That was my favorite track as a kid. I raced there on 80’s up and through 250’s, pretty much. Did you ever hit up Mill Creek? I never actually got to ride Mill Creek. My brother has raced up there a number of times. I think when Mill Creek opened I was kind of winding down [riding] a bit, going to college and stuff. I wasn’t sure how long that place has been around. Seems fairly new then? I mean it’s been around for a while now, but at the time it was pretty fresh. You mentioned earlier your love for bicycles as a kid. How did that love transition towards moto? It was my Dad, really. He raced motocross when he was younger, and so he introduced my brother and I by having the races playing on the TV. He would take us to the Dallas supercross, too. Maybe my brother was more immediately interested in it, but for me I always thought, “This is cool.” But I couldn’t see myself doing it. My brother got a KTM 50 Jr. for his seventh birthday, though. We were both super surprised. I was nine years old racing the 50 Open class on a Junior. I was by far the biggest kid on the gate. [laughs] Oh wow. 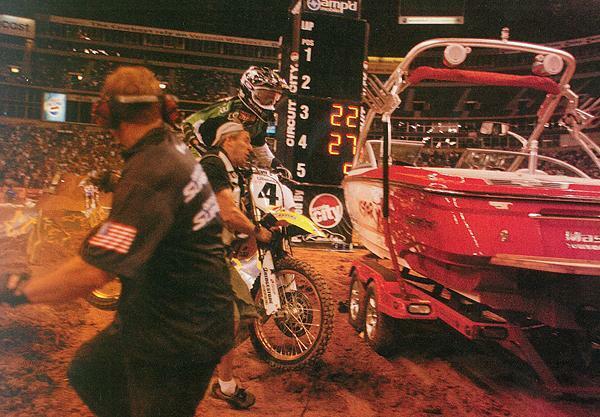 Did you happen to catch the Dallas SX when Carmichael almost hit the boat? That was ’06… I thought maybe you might’ve been there for that moment. That’s funny. I actually hadn’t even heard of that. I moved out of Dallas in probably ’98 or ’99, so that was after my time. You were seeing more McGrath and Emig. Carmichael was on 125’s. Nathan Ramsey was racing. Ezra Lusk. Those guys. You mention on your website that your first foray into film was shooting you and your brother riding. How did that come about? Basically how I got into filmmaking, it was a mix between motocross and Star Wars, really. My Mom had done broadcast stuff in college, and even though she went on to become a lawyer she had some experience in video. When my brother and I started racing she would video us, and eventually she got… what’s that program called? Pinnacle Studio? Some mid-level editing program from back in the day. She could cut some stuff together [on that]. I though that was cool. I was always into photo and computer related stuff anyway, so I started messing around with Pinnacle, cutting videos to punk songs or whatever. At the same time I was obsessed with Star Wars, and I discovered you could use Photoshop to make your own lightsaber effects. It was a combination of all of those things that led to this increasing fascination with filmmaking and its process. I’ll admit. I’m not really a big Star Wars fan, but my friends are. I had to witness the backlash that was The Last Jedi. I wasn’t sure if you saw it or not. I did see it. I feel like all of these new Disney Star Wars we’re getting, I just consider them to be high-budget fan films. Kind of. [laughs] I mean, I enjoyed them. I didn’t have the major issues that my friends have had. I think part of the reason I wasn’t offended was because I feel like all of the stuff we get from here on out is just bonus. Nobody expected Star Wars to come back, so. Everybody’s getting their pitchforks ready for J.J. Or, wait. Abrams didn’t do the Last Jedi, did he? Yeah, Abrams did the first of the comeback series. He’s safe. People like him, I guess. They felt like Rian Johnson was just getting a little too loose with the characters, I think. I wanted to ask you about your fascination with film. I noticed in one of the moto videos you have on your site, you shot some portions of it on your Arriflex. Where’d your love for film come from? I ended up shooting this silent film on 35mm and totally fell in love with the way it looked. You know how after you shoot your film, you have to go in and get it transferred to digital so you can edit it? I remember walking into the transfer suite and there was a little monitor where they had a picture pulled up. I assumed that the picture was from the last job that they had transferred, because I almost didn’t recognize it. But as I looked closer I realized it was the footage I shot. It looked way better than I had even imagined it would. You couldn’t believe that’s what you shot? Pretty much. I still have moments like that. I don’t get to shoot film nearly as much as I like to, but that experience of going in and seeing what you shot come on screen for the first time is the best feeling, really. I’ve been shooting some pictures on film. I’ve never been a big photo guy, but once I picked up shooting on film I learned why I didn’t like photography. I’m by no means a good photographer, and being a good photographer takes talent and effort, but as someone who is doing it as a hobby I didn’t enjoy the fact that all I had to do was click a button and a picture appeared. Whereas with film, there’s this process to it. I have to load the film, I have to make sure my settings are correct, and I have to get the photos developed and printed. That ultimately helped me understand why I enjoyed video more too. No matter if you’re shooting film or digital, there’s a process to it. A video doesn’t happen in an instant. It’s always a process. Kind of like delayed gratification. You have to put in the time, and over time the end result starts to reveal itself. You were born in ’88, right? In today’s era where kids grow up exclusively with digital technology, you had to cut your teeth on tape, MiniDV, film, and then become introduced to digital. You grew up as the technology evolved. I mean, it’s definitely different. I guess you could say that. MiniDV, when I was getting started, was the start of the digital revolution. The early 2000’s were when digital was just starting to get a little sway in actually big movies. MiniDV was the first thing to allow anybody to play with filmmaking. I guess you had Hi-8 before that, but MiniDV was the first prosumer-level medium. For a few thousand dollars you could get a pretty decent camera with manual controls and everything. I think the biggest turning point towards today’s filmmaking industry was when the [Canon] 5D’s came out with the ability to shoot video. For one, those were the same price, or cheaper, than the good MiniDV cameras, but they allowed you to use 35mm sized lenses and shallow depth of field. They were smaller, too. That eventually led into the whole thing with RED that you see now. Everything is getting better, smaller, and cheaper. I guess it was starting when I was getting into [filmmaking], but it’s even more accessible now just as far as like, being able to get really nice looking stuff without spending tons of money. Colton, following the natural progression from tape to digital with his RED Epic (and Arriflex) piece, “BPM Swag.” 2012. It’s becoming easier to look professional. Something to differentiate yourself a bit. That’s true even outside of action sports stuff. Even with the narrative [filmmaking] that I do. You go to a film festival and everything is shot on digital, but when you see something pop up that was shot on film people want to check it out because it’s something different. Would you say that you’re a more well-rounded filmmaker because you grew up shooting with different mediums? Umm, maybe. For me personally, film was always the gold standard. That’s something I’ve always wanted to shoot on. Once you start actually working in film, dealing with budgets and working that balance between what a story requires and what a budget can afford, you really start to realize that the format you use isn’t as important as the way you’re using the tools you already have. This was one of many “reality check” moments I’ve had in my life. I’m a DP (Director of Photography), so I don’t really direct. I just focus on the lighting and the camera. So that’s my whole world, just trying to make everything look as good as possible. I remember watching another DP’s reel, and it was a really amazing reel, it had great footage throughout. It made me want to check out some of the movies he had shot. I looked up a trailer for one of the movies he shot. It was the same footage from the reel, but the sound in the trailer was really bad and it made his footage look worse. That was the moment where I realized it takes the whole machine working together [to make something look great]. In the end, I feel like visuals are something that people are most forgiving of. If you have good sound and a good story, good acting, people are going to watch it and like it. No matter what it looks like. But if it looks great and the acting or sound is bad, it’s not worth watching. I think what makes great movies great are the elements that you never notice. You may watch a scene a hundred times and not notice some tiny element, but if that element wasn’t there, something would feel off. Did you ever want to pursue a career in moto that related to film? Or were you always set on being involved with narrative work? I understand around the time you would’ve been making that decision, 2005 / 2006, video in the moto world wasn’t necessarily booming. I think it was more the latter. Like you said, being a motocross-specific filmer or videographer wasn’t really a “thing.” Obviously there were the movies like Mini Warriors and Terrafirma, movies that I thought would’ve been cool to make around that time. At that time there were guys at the track who would film kids riding and send them a tape a couple weeks later. Beyond that, there wasn’t really much. Like I mentioned earlier, when I was a kid I started off editing stuff to music, but what really kicked it off, that film was something I really wanted to do, was the first time I realized I could shoot multiple angles of [a scene] and piece them together. When I realized that, I thought it was amazing. I think my personal preference really leaned towards narrative. It’s like discovering something that you didn’t know existed. And obviously looking back now, that’s how you make movies. But discovering that I could do that… Even as a kid, I just liked putting my handprint on things. I always liked to do things myself. I designed my own graphics kit when I was on 125’s. Motocross Madness 2 was the game of choice back in those days, so I was all about building my own tracks. I always liked the idea of being able to make something myself, so when I realized you could do that with movies, that was a big thing. I was a little late on the video game front. I was more of an MX Unleashed kid. I never played Motocross Madness. I think the earliest game I played was… what was that one for Nintendo 64? The only thing I remember about it is that you could jump a big canyon. Like, you could jump the Grand Canyon on one of the tracks. [laughs] It was a 3D-based though, it wasn’t 2D like Excitebike. Well there was Excitebike 64, which was the 3D version. And there was a track you could jump a canyon on. You had to powerslide with the right trigger, or something like that. I’m going to look this up… Yeah, it was Excitebike 64. [laughs] How’d you find MX Simulator, by the way? That was really random… I’m trying to think, why did I get into MXS? Like I was saying, I made tracks for Motocross Madness back in the day… Even for MX Unleashed, I think? There’s so many MX vs. ATV games. It was the one before Reflex. I don’t even think it was Untamed. It was one of them that came out for PC and there was still a track editor for it, so I did a couple tracks for that. But I hadn’t touched video games for over ten years. I think what really set it off was when we moved to Portland, my wife and I, we were looking for land. We still are, but one of things I would like to do when we find it is to build a pit bike track. We had been looking at a lot of properties when it reminded me of my track building days. I thought it would be fun to build a virtual track again while we wait to find someplace real. Obviously I don’t have any of those old games now, and they wouldn’t work on my Mac anyway, so I had to look for a current motocross game that worked for Mac. MX Simulator was the only thing that came up, so I forced myself to learn how to not fall down every two seconds so I could build tracks in the game. That learning curve is gnarly, man. Yeah! I was hyped to find MXS, though. It’s a game I wished existed when I was a kid. You can actually high-side… once you get past that learning curve, it feels like you’re actually riding. Most of the other games that came before MXS didn’t have that. My friend and I dedicated a whole summer to learning how to play MXS. Learning setups and getting smoked online. I didn’t even touch my setup until a few months ago, because I was so intimidated by all of those numbers. I just ran the stock setup. Holy cow… I had a pretty busted setup for awhile myself. I don’t play much these days, but I’ll load the game up every couple months and it always amazes me how bad I am. You have to keep playing in order to be even remotely good. So you’ve made a lot of tracks in MXS? I actually haven’t, because I’m too much of a perfectionist. I’ve only released two. I enjoy it, though. It’s just a fun hobby to do. I actually am helping out with the EMF series right now, with the outdoors. It’s been fun working with those guys. Colton’s baby, a meticulous replica of Monster Mountain during the mid-2000’s. Recreated in MX Simulator from old Cycle News photos and video of Alessi and Millsaps. If you play, you can download it here. Is that Checkerz and… I’m not really sure who all works on that stuff anymore. Yeah. Checkerz, Race [Karlin], Alex Effertz, all those guys. Getting back to filmmaking a bit, did you pursue any higher education in film? I went to college, yeah. I didn’t go to film school though, I went to a liberal arts college that had a tiny film program. It was kind of cool because it was so small. I got a lot of individual attention there. It was there that I realized cinematography was more my thing. I loved the crafting and storytelling that came with writing and directing, but I noticed when I was on set that all of my attention was on what the camera and lights were doing. Talking to the actors always ended up being something I had to do to get the movie done. The lighting and the camera stuff was what I really enjoyed, though. I ended up working with a buddy of mine, Bryce McGuire. He directed and I shot, and it was just like, “Oh! This is how it’s supposed to be!” He covers the acting and actually writing the story, and I get to support that with the visuals and everything. That’s how I ended up in my specific field. You mentioned earlier in your track building days you were a perfectionist, and I think being a perfectionist and being a cinematographer are synonymous. Cinematographers have to have really good technical knowledge in what they’re doing, but they also have to be able to work with somebody who’s looking for a certain image, and the cinematographer has to be able to process the words from that person into the numbers and formulas required in the camera. The craft is very precise. Do you prefer free reign, or specific direction? Specific direction. I like having somebody with a strong vision. You can have that creativity with free reign, but with specific direction you get more refined creativity. Rather than having to come up with ideas yourself, you’re creating ideas on top of somebody else’s ideas. You can kind of sharpen them a bit. Does that make any sense? Yeah. They give you an outline and you can offer your expertise to areas they might’ve overlooked. To me, that’s a more complete process. There’s a couple of people I’ve worked with a number of times and it’s always been good, Bryce McGuire being one of them. On my website there’s a few different things that we’ve done together. Then there’s another guy, Adam Cushman, who I’ve shot two features for as well as some shorts. Those are two people that I’ve worked with a lot, but there’s a handful of other people I’ve got to work with. Rod Blackhurst is one. On my website there’s this one-take short film with the Super Trooper guys [Broken Lizard], where he directed and I shot. I’m sure you’ve found it’s the case with action sports as well, that the relationship between friends is made by doing smaller projects together, doing whatever it takes to get something out there. Then as each person climbs their respective ladder, I’ve found that most film people are pretty good about trying to bring up the people they worked with when they were small. That’s kind of cool to be in an environment where you’re supporting your friends and your friends support you. You’re all trying to climb the ladder together. And that’s important for film too because, as we were talking about earlier, the whole machine matters. I can’t really think of any other art form where collaborating is such a necessity. Some things in film are just impossible to do on your own. There are some things you can do by yourself, but for a lot of it, you need the support of other people around you. I may have to support a director, but even I need the support of my camera crew and my lighting crew. We all depend on each other.